The Monster Drawing Rally returns for a second year of drawing under the summer stars. MDR is a drawing event and fundraiser featuring more than 75 Portland-based artists. Part performance, part laboratory, part art bazaar, the Monster Drawing Rally is an incredible opportunity to watch some of your favorite Portland artists create original drawings from a blank page. 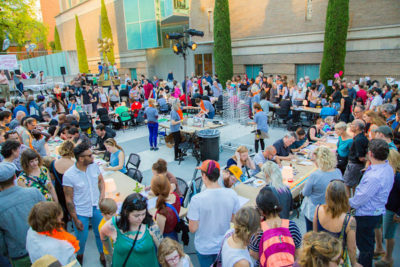 The event begins promptly at 6 p.m. in the Museum’s courtyard and consists of three one-hour rounds that each feature approximately 25 different artists drawing simultaneously. As the drawings are completed, they are immediately hung up and made available for a flat price of $35 each. If more than one person wants to purchase a particular work, the winner will be determined by drawing straws. Proceeds support free school and youth programs at the Museum. The Monster Drawing Rally provides a unique opportunity to watch a drawing come to life, and to purchase a work of art minutes after its completion. The Museum will also feature the Li’l Monster Drawing Rally, a section where children and families may sit, draw, and display their work for the evening.